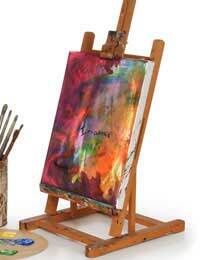 A great way of being able to sell more than one copy of your original artwork is to create prints of your painting. You can do this easily yourself, but the equipment is very expensive to buy, or employ the services of a professional printer specialising in producing prints onto canvas or high quality papers. limited edition prints are a great way to raise much needed capital after the sale of the original. However, you will need to arrange for the prints to be made before selling the original as it will be needed to make the prints. You will need to decide what kind of print you want of your artwork. You can opt for a canvas print of oils and acrylic, while watercolour lends itself to framed prints in high quality paper. Whichever method you choose you will need to decide on a print run. Most runs number from between 250 and 1000, depending on the popularity of the piece. That said, the lower the print run the more highly sought after the piece. Postcards, bookmarks and greetings cards are a great way to make extra income. You won't need to limit the print run, which means you can keep a popular piece circulating indefinitely. It also offers an option to people who can't perhaps afford an original or limited edition print of your paintings. Printers offer some really good deals on printing smaller items such as cards, postcards and bookmarks, so be sure to shop around for the best ones. Also, don't discount online services as they can prove to be even more cost effective than traditional printers. Ordering in high quantities can also lead to substantial discounts, but don't buy in large numbers until you have checked out the viability of the market first. While this may seem completely off topic, it is a great way to raise money, and it can prove to be a great way of raising much needed finance. Try having T-shirts with your artwork printed onto them. People will always need clothes and these often prove to be really popular with adults and children alike. You can also print slogans, such as 'I visited the Canvas Witch and watch her paint for a spell'. Once you start to think outside the box you will find that the possibility for expanding your product range, while still involving your artwork, is endless. Prints and associated goods often sell better than the original work. Be prepared for this and keep the original safe, because as your name grows so will the call for your original artwork. Don't get caught up in producing prints of all of your work. Choose your best sellers, or pictures that you have researched and know will sell well, and turn these into prints. Try to keep prints to limited edition numbers as it will ensure that they are more desirable. They will also command more money than print runs without numbers. Most of all, believe in yourself and your abilities and eventually your work will sell itself.